We've been organizing Everest expeditions for over 35 years, and each year do our best to put together a strong team with compatible climbers and top notch western and sherpa guides and leaders. Since 2009 Eric has been ably assisted by IMG's Greg Vernovage. We fill our trips, and thus can be picky; we've turned away many climbers whom we feel will not be a good fit with our program. 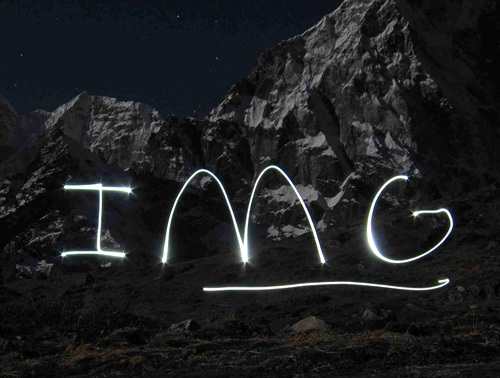 IMG has long been a leader in innovative climbing programs to the Himalayas. We were one of the very first companies to offer guided programs to Everest (1991), the first company to offer a stand-alone climb to the North Col (1994) and to 8000m (2001). We were one of the first companies to guide Shishapangma (1990) and Cho Oyu (1995), first to guide the Khumbu Icefall as a stand-alone program (2000), first to offer the option of personal sherpa guides to climbers (2002), first successfully guided climb of Lhotse (2009), first with the Hybrid concept (2010), first to offer an Everest "Express" itinerary (2010), and the first to rappel an alternate route around the Hillary Step (2013). With over 600 summits of 8000-meter peaks to our IMG credit, and 518 of them on Mount Everest, we are still never satisfied and continue to look for ways to improve our IMG Everest program. For 2020 we continue our tradition of innovation and attention to the details. We put in place first class logistics and staffing. We don't cut corners. Our goal is to conduct the very best program that we can, at a fair price. We don't think you will be disappointed. If you would like to join a world-class expedition to Everest, please give this Everest 2020 document a careful reading and then contact our IMG Team if you would like further information! The 2020 IMG climbers and trekkers will travel to Everest Base Camp in three separate teams, each led by IMG guides and sherpas and composed of a nice mix of climbers and trekkers. For 2020, we will be using helicopters from KTM to Lukla for our Teams 1, 2 & 3. Inclement weather can cause delays with the fixed wing flights and by utilizing helicopters, we will have a much better chance of staying on schedule. Our Lobuche Base Camp strategy has been working great the last 9 years, and we'll do it again in 2020 for the trekkers and climbers. Three nights of camping at Lobuche BC (with gorgeous day hiking in the area) provides for excellent acclimatization and means our climbers and trekkers will feel good when it's time for them to move up to Everest Base Camp! We'll have our own sherpa cook team preparing meals at Lobuche BC to keep our team members healthy. 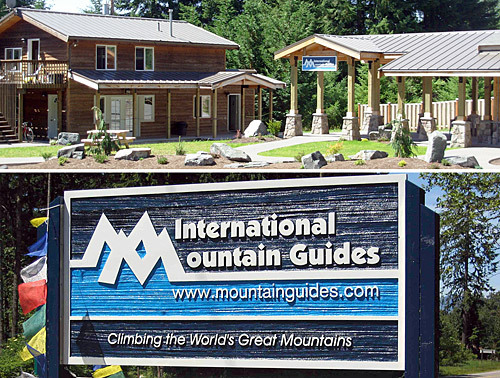 We will have two separate (adjacent) base camps, one for the IMG Climbers, and one for our IMG Sherpa team. Each camp will have separate dining, toilet, shower, and kitchen facilities. In between the camps, we have our common meeting facility  the giant Eureka Military MGPTS tent, complete with 70,000 BTU military hazmat tent heater that runs outside the tent and pumps the heated air inside (so no danger of carbon monoxide). This is the place to be if you want to hang out in a carpeted and warmed environment, watch movies, read, work on the computer, make a phone call, or just socialize! We have good charging capacity with both 12v solar and backup generators. Wireless internet will be available at Base Camp (price TBD). 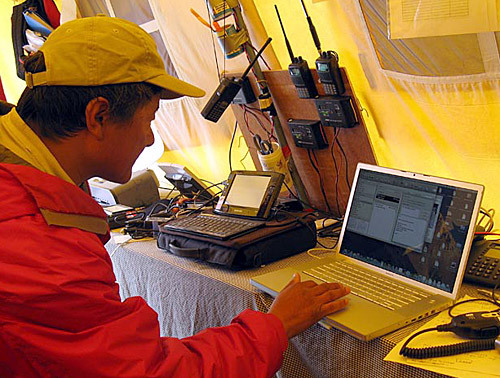 In our Communication tent, we have a VHF radio base station and large antennas that let us talk with the South Col and all the way down to Pheriche. We subscribe our climbers and Sherpas to the service provided by the HRA Base Camp Medical Clinic so you have access to unlimited consultation with the HRA doctors. Nothing is more important to health and morale on a long trip than good food. 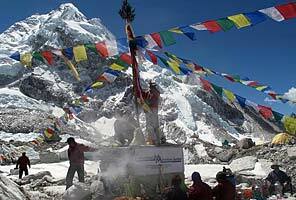 We have very experienced Lobuche BC, Everest BC, and Everest Camp 2 Sherpa cook teams. At Base Camp, they bake fresh bread, rolls, cakes, etc. on a daily basis. We receive regular deliveries of fresh fruit, vegetables, and meat to Base Camp in addition to staples purchased in Kathmandu and "goodies" brought from USA. We also include gluten free and vegan options (please advise if you have food issues). Most climbers will spend about two weeks at high altitude (over 6000m/20,000ft) during the course of the trip, when appetites really wane and life is truly miserable. We assist climbers to choose their high-altitude food items at Base Camp from our food supply tent, so you know exactly what you will be eating up high. Also, climbers should bring about 10 pounds/5 kg of additional "lunch" snacks which you know you can eat at high altitude, when some people's appetites become very picky. This is the program which the majority of our IMG climbers have done over the years and is perfect for the climber with previous experience on big mountains. This is a complete expedition: no cutting corners, nothing less than the finest support on the mountain and offering you the ultimate in flexibility to tailor your schedule to your personal needs. This program is led by IMG senior guide Greg Vernovage and Ang Jangbu Sherpa (both Everest summiters) and includes unlimited consultation with the IMG staff, consultation with the docs at the HRA BC Medical clinic, Icefall fees, all expedition food, communications, oxygen, Sherpa support, complete trek service, and total expedition logistics from Kathmandu to Kathmandu. You will be assigned a personal sherpa guide for the acclimatization rotations and summit attempts. IMG does not allow members to climb solo. Our itinerary includes staying at our custom Lobuche Peak base camp for great acclimatization hiking on the way to Everest BC at the beginning of the expedition, a subsequent ascent of Lobuche for further acclimatization and training prior to the first rotation on Everest, then two acclimatization rotations (one to C2 and one to C3) prior to the Everest summit bids. The goal is maximum practice and acclimatization before going high on Everest, for the best possible chance of success. Many of our customers have told us they want a higher level of support for climbing Mt. Everest. Now we have what you are looking for, with our revamped Hybrid Program which combines the oversight of our IMG Guides and Coaches, along with additional Sherpa Support (two Sherpa guides per climber) and Extra Oxygen (enough for climbing @ 4 liters per minute on the Summit Day). The general itinerary for the Hybrid Program is the same as the Classic climb. This program is led by IMG Expedition Leader Greg Vernovage and Ang Jangbu Sherpa (both Everest summiteers). You will be assigned your personal Sherpa guides for the acclimatization rotations and summit attempts. IMG does not allow members to climb solo. With this revamped Hybrid Program, you will have more flexibility than if you were required to follow the schedule of other climbers. This program will give the Hybrid climber the maximum flexibility while climbing, maximum Sherpa support, and a generous amount of oxygen. For the customer who is not cost sensitive, and who wants the optimum support, we assign one of our senior IMG guides (an Everest summiter) on a 1:1 basis and include our "extra" oxygen option (4LPM on summit day). This is the Cadillac program for the discerning climber who wants the very best. If you would like to visit Everest Base Camp with our Teams 1,2, or 3 and stay longer and go higher, bring your crampons and ice axe and add a climb of Lobuche Peak (to over 20,000 feet--we stop at the false summit  the last pitch to the real summit is difficult technical climbing). After spending several nights at Everest BC for acclimatization, our Lobuche climbers, guides, and Sherpas will drop one day back down the valley to climb this beautiful peak, with world class views of Everest from the summit. From the beautiful IMG Lobuche Base Camp tucked up a side valley from the EBC trek route, the route climbs to a high camp, then from there up rock scrambling to the glacier, which leads to the summit ridge. The steeper parts of the climb to the ridge are normally fixed with about 500 meters of rope. Lobuche Peak is a perfect objective if you are fit and have Mt. Rainier type skills. (ice axe, crampons, roped glacier travel). We will review use of fixed ropes for climbers who have not done this before. Afterward, trek back out to Lukla with our crack Sherpa team for the flight to Kathmandu. Please see the Lobuche Expedition Pages for more info specifically on Lobuche Peak. Our Khumbu Icefall programs are for the climber who wants an up close and personal Everest experience without a summit attempt! All climbers join the Lobuche Peak itinerary with IMG western and sherpa guides, for instruction and evaluation. 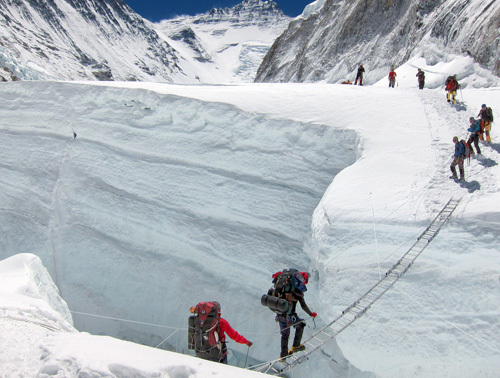 Then, you climb the famous Khumbu Icefall and beyond with your 1:1 sherpa guide. This is serious climbing, with some risk, so you need to be in good shape and have solid skills with crampons, fixed rope, etc. Camp 3 climbers will be provided oxygen for you to practice with as you climb the Lhotse Face to Camp 3. For the really fit and adventurous climber, if you are thinking about coming back to climb Everest someday, this is great practice! Lhotse climbers accompany the Lobuche climbers to EBC, and for the acclimatization climb of that peak. After that, we have two rotations planned (same as for Everest climbers) to ensure that you are ready to ascent the world's 4th highest peak. The Lhotse route follows the Everest route to above the Yellow Band, then heads up the couloir. Lhotse is a stiff climb, more difficult than Cho Oyu. Our Sherpa team will fix the route all the way to the summit, but there is steep ice and rock in the Lhotse Couloir so you need to be very fit and capable. 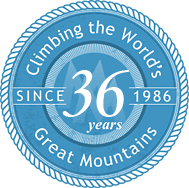 On summit bid you will be provided 7200 liters of climbing oxygen (same as Everest climbers) with 1800L at C3, 3600L at Col, 1800L higher on the climb. The goal will be to descend to C2 after the summit. IMG has now done six Lhotse climbs, each successful ('09, '10, '11, '12, '13 and '18). Please see the Lhotse Expedition Pages for more info specifically on the Lhotse climb. For experienced climbers, we provide the option of a shorter itinerary and a different acclimatization profile. We can tailor the itinerary to shorten the total length of the expedition buy using pre-acclimatization, additional oxygen, and use of helicopter to expedite travel to and from Base Camp. Please contact Eric Simonson and Greg Vernovage to discuss this program and various alternatives. The trek to Everest BC is one of the world's classic human powered adventures! We have three trekking departures to Base Camp; each trek accompanies the IMG climbing team with sherpa and western guides and sees all the famous sights on the way up the Khumbu Valley. Our itinerary includes staying in lodges between Lukla and Pheriche, then in our custom Lobuche Peak base camp (for fantastic acclimatization hiking) for several nights prior to moving on up to Everest BC at the beginning of the expedition. Rub shoulders with the climbers and see what a real expedition is like. Climb Kala Pattar, hike up to the base of the Khumbu Icefall and get some photos, then join in with the expedition puja ceremony at Base Camp. You stay overnight at Everest Base Camp as a guest of the expedition; only trekkers associated with expeditions are allowed to stay at EBC. Then, trek back out to Lukla with our crack Sherpa team for the flight to Kathmandu. For trekkers wishing to extend their trek, we have the Gokyo Extension Option with Trek Team 3 which adds 6 days of trekking. You'll cross two more high passes (Cho La and Renjo La @ 5300+m) and visit the famous Gokyo Valley. What a classic! From the summit of Gokyo Ri you see Cho Oyu (8153m), Gyangchung Kang (7922m), Lhotse (8501m), Makalu (8475 m), Cholatse (6440m), Taweche (6542m), Kantega (6685m), Thamserku (6808m), Lobuche (6145m) and Mt. Everest (8848m). Our Sherpa led Everest trek, with top notch support and logistics, this group also stays at IMG Base Camp, near the end of the expedition, normally about the time of the summit bids. This is an exciting time to be there! After the Base Camp overnights, trek back out to Lukla with our crack Sherpa team for the flight to Kathmandu. With a slightly accelerated itinerary, you can do this trip in 3 weeks of vacation time! IMG's leadership team is exemplary and multi layered, ensuring depth and continuity when a lot is going on! The overall Expedition Leader is Greg Vernovage, a Seven Summiter with successful ascents of Everest, Lhotse, and Cho Oyu. Greg has led many dozens of expeditions for IMG around the world, including 8 Everest Expeditions. He is supported on Everest by several additional IMG coaches from USA. Sharing leadership is Ang Jangbu Sherpa, who has worked on every IMG Himalayan program since 1991. Ang Jangbu Sherpa and his Nepal staff put together every year for IMG one of the very best Sherpa teams on the mountain. We are proud to have a group of Sherpas working for us who are among the best paid, best led, best equipped, and best trained in the business. 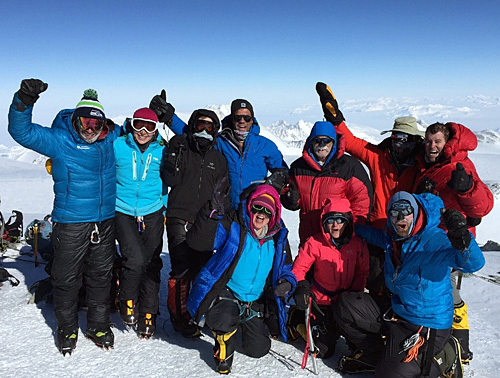 Advice from Everest Summiters: tips for a successful expedition from training to summit. Details for this option depend on the schedule and service desired by the climber. Please contact us for custom options. 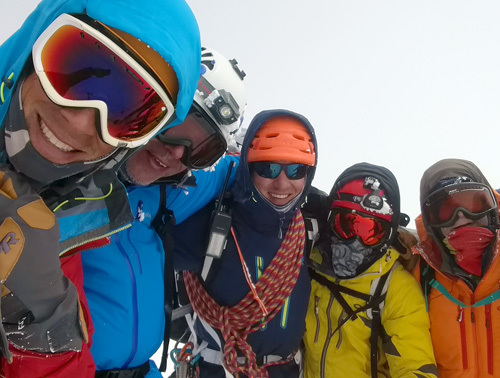 30 summits on this expedition! I wanted to take this opportunity to thank you and your entire staff for running such a great Everest program the last two years... Ang Jangbu's management is perfect. Our Sherpa team is beyond outstanding... I saw some crazy things on summit day by other teams and was so proud to be with IMG!